Home / Blog / In The News / Craft Beer Booms in the Bluegrass State! Beer is booming! But if you are reading this post, then that’s no surprise to you. With near fifteen percent growth for each of the last two years, many don’t know that the craft beer industry is one of the brightest sectors in a flimsy economy. Even in the sleepy Bluegrass Region of Kentucky, the sudsy trends are beginning to take hold. With two new breweries opening in the past year and two more slated for the upcoming months, Lexingtonian’s thirst for beer is emerging with force. The collective patience that Central Kentucky portrays has impelled the beer scene. We who live here kid that we are always twenty years behind. What’s really happening is that we aren’t as swayed by rash trends or as adventurous as a culture as many in more progressive and daring cities. (Hell, we never even took sides during the Civil War.) This notion may explain why craft beer has been slow to evolve here, leaving our beer enthusiasts to revert to long travels, on-line trading or sales, or worse — buying the industrial domestic products are marketed on race cars and billboards. The mid-1990s saw the microbrewery trend catch fire with excitement, until they folded for similar reasons. The Oldenburg Taproom (Kentucky Brewing Company) and the Lexington City Brewery rose quickly and fell even quicker, mainly due to the large financial undertaking of the beers and facilities that their infant fan base could not support. As the memories of those companies faded, many drinkers resumed their bourbon, wine, and cocktail trends. (It seems that the memory of those beers now is certainly greater than the support they got when they were open. The longer those breweries remain closed, the better their beers get!) What we didn’t know then is that eight out of every ten microbreweries were failing across the country — not because the beer drinking populous was digressing, but because they were getting smarter. No longer were we supporting poorly constructed microbrews and their money-grubbing cheap ale producers. We started to understand the differences between a watery hefeweizen and a high quality Franziskaner. We turned from grassy IPAs in favor of Goose Island IPA, and similar examples span the 100 or so styles of beer that were available elsewhere. When the Kentucky Brewing Company and Lexington City Brewery closed, it provided a void of local options. But that same void made Lexington attractive to the quality breweries who remained in the local market — Goose Island Brewery, Sierra Nevada Brewing Company, Stone Brewing Company, Dogfish Head Brewery, and later Three Floyds Brewing Company and Founders Brewing Company. With free reign on a community of a highly educated, half-million population of largely young professionals with a thirst for beer, these breweries enjoyed great success. The bourbon-insired “loose” alcohol laws, no alcohol cap, and easy access along I-64/I-75 all made it easy for breweries to get their libations to Bluegrass connoisseurs. Although the defunct local breweries bit off more than they could chew, a few bright spots for beer remained. Quality beer bars like Marikka’s Bierstube and Pazzo’s Pizza Pubbecame the conduit for getting the flavors to customers with dedication to the craft beer market and a pleasant atmosphere. In that ten-year span, a few existing pubs began adding quality bottles and taps to their portfolio while theChase Taproom and a few chains like BHG’s The Pub andOld Chicago sprout up periodically. Still, the region had not dedicated itself to the building beer culture that was on full display in similar-sized towns like Eugene, OR, Boulder, CO, or Asheville, NC. Residing under the radar was Alltech’s Lexington Brewing Company, also known as the “Kentucky Ale” brewery, which was a resurrection of the nostalgic Limestone Brewery that closed a few years prior. Famed for their Hemp Ale and Limestone Ale, Limestone Brewery prided themselves in local limestone-rich water, indigenous ingredients, and surly personalities, however their quality and consistency never measured up. Thus, much of their beer was enjoyed as novelty and never really taken seriously. The residual effect of the Alltech purchase was a microbrewery that operated according to older and more traditional brewing models. To pay homage to the frequently defiant Lexington Brewing Company, which had operated prior to, after, and actually during prohibition, Alltech’s operation took on the namesake for their brewery. 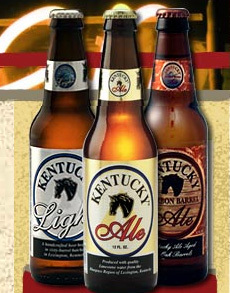 Kentucky Ale came out first, followed by Kentucky Light (Kölsch-style ale) and Kentucky Bourbon Barrel Ale. These brands soon became flagships that Lexingtonians could call their own. With a sparse one-off release for the Pro-Am division of the Great American Beer Festival or a whimsical notion at trial-and-error, the brewery only timidly accepted the craft beer culture that was developing a local flare and the brewery remains somewhat remote and disconnected from their fans. All those conservative notions, however, have changed in the past few years. Starting with the 2010 opening of The Beer Trappe by the same family who owns Pazzo’s, the craft beer scene exploded and beer was not only openly acceptable again; it was thriving! Now known as one of the Top 100 Beer Bars in America by Draft Magazine and one of two Kentucky beer establishments mentioned in Christian DeBenedetti’s “The Great American Ale Trail ,” The Beer Trappe became a catalyst for aspiring craft beer enthusiasts turn entrepreneurs. Its dedication to craft beer culture is inspired by Belgium and inspires like-minded venues like Lexington Beerworks, a bottle and homebrew shop doing for downtown Lexington what The Beer Trappe does for the Chevy Chase neighborhood. With growth, however, come growing pains. As the frenzy of craft beer escalated across the country, many breweries that enjoyed tremendous success in the region begin retracting their products — not because the interest floundered, but because the demand for their products closer to home required that breweries shift their distribution. The exodus of Flying Dog, Great Divide, and others became a gleaming opportunity of a new breed of beer business owners. Now the time is right — high interest and low competition fuels the opportunity for microbreweries to flourish in Lexington once again.But let’s not overlook the inspiration of what was happing a half-hour’s drive south of Lexington. The opening of two smaller nano-breweries in Danville elevated the awareness of hand crafted beer for the quaint but liberal college town. Beer aficionados flocked to The Beer Engine and Lore Brewing Company, which quickly rose from the recently repealed prohibitive alcohol laws. Along with V the Marketand Bluegrass Pizza & Pub, these daring artisans and appreciators started to introduce the craft of proper beers to an audience who rarely looked up from King of Beers or wines with a Kangaroo on the label. Enter Country Boy Brewing Company and West Sixth Brewing Company. Both opening within the past seven months, they now have a few locally produced beers of their own. Each of these breweries embrace the community in charming and unique ways. A visit to Country Boy’s taproomseems more like going over to your ole buddy’s garage to brew with him and take on a few of their highly experimental beers. They certainly celebrate the rural attitude of the farmhands around the Bluegrass while situated steps from the University of Kentucky campus. The West Sixth brewery is the artistic and streamlined brewery that occupies part of a funky and hip culture of beer and straddles your comfort zones with art and flavor. Both are best enjoyed at their respective taprooms, however West Sixth distributes cans of its flagship IPA. Both breweries keep the beer drinker’s attention with special releases and events that keep us all coming back. Although Lexington’s beer culture has extended from what’s local to passersby and becoming a craft beer destination in its own right, I can only give brewers and beer-tenders a portion of the credit. I contend that the recent interest in beer stems from the bigger picture of the overall interest in all-things-culinary. Even in our struggling economy, we demand better, fresher food. We expect quality on the plate and we expect it at fair price and with low pretension. Even teenagers understand the taste of sushi; they know good feta from bad, and they understand that good chicken sandwiches should be whole meat. They are a new breed that knows not of Wonder Bread or cheese from an aerosol can. They grew up knowing that coffee is better at the coffeehouse and not from granular instant versions. More importantly, as they turn of legal drinking age, they know a world where craft beer isn’t only available, but is a better option. Their palates are much more equipped to developing interest in true beer flavor than our fathers and this upward trend has spawned a new type of dining experience — the gastropub. The first of its kind, The Village Idiot, opened less than a month ago. The Idiot revels in its recommended pairings of gourmet burgers with American Brown Ales, duck sliders with American Pale Ales, savory date and bacon appetizers with Dopplebock, and bread pudding with Bourbon Barrel Ales. It’s no longer acceptable for a Sommeliers to tell you which wine to drink with marsala; now Cicerones explain the links and contrasts of the flavors in the dish to the flavors of the beer to create a culinary event that uses beer to heighten the sensation of taste rather than mindlessly accompany the plate. It’s a new way to enjoy beer in all its glory and Lexington has embraced it beyond measure. Now slated to open within the next few months is the Glenn’s Creek Brewery, located in nearby Woodford County, and theBlue Stallion Brewing Company, which will focus on properly sculpted beers in the German and the British styles. With all the chatter about more plans in the works, there seems to be no end to the enthusiasm and thirst among beer drinkers in and around Lexington. As someone who keeps a finger on the pulse of our local beer scene, I am asked daily if Lexington is nearing critical mass when it comes to our craft beer market. I excitedly explain that I don’t know where critical mass is, but I can’t wait to see what it looks like!